Community farming projects are changing lives every day. Bird’s eye chillies have more bite than just the sauces they are added to; they are building houses, buying furniture and opening bank accounts for growers. In the four short years the project* has been on the go, it has completely changed the lives of those involved – for the better, and without exception. Adelina Chinda is dressed to match the red hot chillies she’s picked and has built a brick house for her family. Paulo Mahlango has the widest smile imaginable and says his house now has a brand new roof that doesn’t leak. All big changes from the tiniest of chillies. 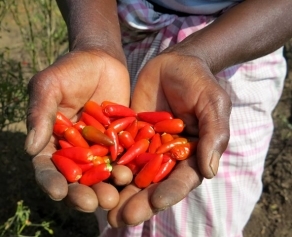 * The chilli project was enabled by the Community Development Facility, a joint initiative between the government of Mozambique, COmON Foundation and Peace Parks Foundation, in the southern Mozambique component of the Lubombo TFCA.